I generally make it a point to profile books that are not only published, but ones that are likely to have made it to the public library system. But today, I'm going to take you into my world of books where I hear about books long before they are published and have the chance to get excited about their release. When I'm really lucky, I get a chance to look at them in a gallery form. There are times that this little perk is all that keeps me book blogging. So it is with that introduction, that I share three books that I picked up at Book Expo America last week. Three books that made my book blogger heart go pitter-patter. You know if I went to the Knuffle Bunny: A Cautionary Musical than I must have a fond spot for the books. (Okay, and Mo.) The plot of the picture books is simple: girl has bunny, girl loses bunny, girl finds bunny again. But it's not about the plot. In the first book, the subtext is the frustration of a toddler in not being understood (Aggle Flaggle!) and the helplessness of the parent in not understanding. The reward at the end is Trixie's first word - and by extension the families move to the next level of communication. In the second book, the loss of the bunny is surrounded by a conflict with a peer and ends with a discovery of real friendship. The parent conflict contained within is that of mothers and fathers struggling with encouraging strength and independence, yet wanting to save our dear children from any hardship. The third book sees Trixie on a trip to Holland to see her grandparents, and losing Knuffle Bunny this time exposes the whole family to the idea of When Hope May Be Lost. I won't give away the ending, especially in terms of what is learned, but I don't believe that you'll be disappointed. This title is available September 2010. If you haven't met Clementine yet, than you really must get to your local library and pick up the first three books in the series. 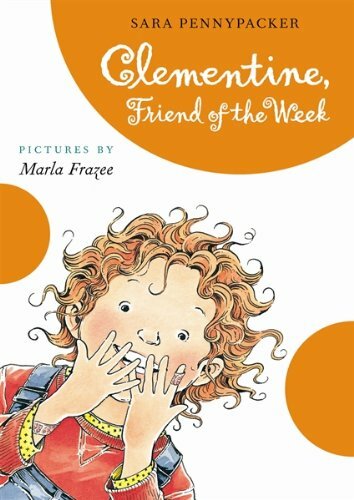 Clementine is another spunky girl, following the trend of Ramona, Junie B.,and Judy Moody. I like all of these characters, but would highlight the differences in Clementine. She's not as bratty as Ramona, she doesn't mix up words like Junie B., and she's not a self-centered as Judy Moody. Instead, Clementine is a artistic, clever, attention-challenged third grader who tries to do the right thing, and it too often goes wrong. Amusingly and charmingly wrong. In this new book, she is shares her excitement about being friend of the week with her slightly older best friend Margaret, who then gives her advice on how to act during the week. Clementine gives it a go, but it doesn't work out as planned. In the end, she realizes that she has been a good friend all along - and maybe even inspired others to greater empathy. It's another wonderful book with a good message and winning illustrations. This title will be available July 2010. The First Children's Literature Ambassador Jon Scieszka has been spending his time asking, "What about the boys?" With a book release two years ago of Guys Write for Guys Read (right now bargain-priced at $4.80!) and a Guys Read website devoted to good books for boys, Scieszka has again taken on the role of advocate. This new book of short stories features some amazing authors, namely Jon Scieszka, Mac Barnett, Adam Rex, David Yoo, Paul Feig, Kate Dicamillo, Christopher Paul Curtis, Eoin Colfer, Jack Gantos, and Jeff Kinny in a book intended to bring about the funny. After seeing the authors present the concept in a talk at Book Expo America, I have no doubt that they will meet their goal. Any presentation where Groucho glasses are handed out - well, that has to be a good sign. This title will be available September 2010. Toward the end of April, the "summer reading" whispers started. But now it's June and school is out or almost over, so today I'm shifting gears and thinking about summer reading. Reading is a lot like exercise. You need to do it regularly. When you take a vacation from your workouts, it takes some time to get back to where you were before. If I skip exercising for just ten days, I feel like I'm starting over when I get back. The same thing happens on a reading vacation. For kids, that can last three months! Ouch! To help prevent "injury," schools often send home a "reading list" so students can keep "fit" over the summer. There are lots of opinions about the lists, particularly when the list hasn't changed since you were in school. Just know they are singular in their plea: please keep your child reading this summer. It can be tricky finding books that will keep them reading through the summer, especially with one of those stagnant, age-old lists! So what's a parent to do? First, introduce yourself to the librarians! Libraries across the country will be launching their summer reading programs over the next few weeks, and these programs are a great way to connect kids with books and keep them in tip-top reading shape. Another option is to seek out some books from ... lists of recommended books. That's a reading list by another name, right? Yes and no. Yes, it is a list of books, but it isn't a standardized group of books. These are collections of books created by people who have road-tested the books and believe in their value. The recommended lists are often built around a theme. For example, Reading Rockets (and many other websites) have lists of books by theme or by award or recognition. At Reach Out and Read, you'll find books by developmental age. I love Reading Rocket's guide for how to find that 'just right' book. Hint: read page 2! Yesterday, Susan Kusel took us behind the scenes of creating a book list. She not only shared how book lists are created, but also shows why librarians are the go-to resource for reading ideas. What I love about What's Next, a resource created by the wonderful librarians at the Arlington Public Library, is that it is part reading list, part idea box. I can find suggestions by book format (e.g., picture book), audience (infant through teen), and/or subject (apples to zoos and beyond) Here are two other all-inclusive resources I recommend. Susan Thomsen has her Big List of Lists at Chicken Spaghetti. All in one place you'll find the "2009 Best of..." and "2008 Best of..." lists for children's books. For Share a Story-Shape a Future 2009, we put together a magazine called the Big List of Books. It includes every book recommended by parents, teachers, and librarians; and covers all ages and topics. Many of the resources in these lists include books across the full spectrum of readers, from infants to teens and beyond. For simplicity's sake they are listed just once. Children's Picture Book Data Base - Miami University (OH) maintains a database is filled with more than 5,000 picture books, complete with abstracts! It is designed for educators who are building their curriculum, but it is a very handy tool when you're a mom looking for books about tractors. Toddlers Booklist - On this Montgomery County (MD) Public Library list you'll find books that the librarians likely have used at storytime ... with great success. There is a bookcover image and short description with each title listed. Info Soup - This is a multifaceted, cooperative website maintained by a group of Wisconsin Public Libraries. You can find books via the page of book lists, or you can start at the InfoSoup.org home page and search any or all collections by title, author, keyword, or topic. Zuckerman's Barn Kids Lit - This site offers a searchable database of book reviews by students for students. The goal of the site is to "create a community of readers across classrooms and schools, including both students and supportive adults." Search books by title, author, subject, grade level, and more. Little Willow's Booklists @ Bildungsroman - Little Willow's lists are my go-to recommendation when someone asks for a list. You'll find recommendations sorted by audience, themes, and topics, as well as her personal recommendations. Best Books List @ Children's Literature Web Guide - The University of Calgary (Canada) maintains this site (link takes you to the Guide's topical list). What I love is that the topics go beyond the norm and focus on traits or interest for older kids, like books with artistic protagonists. Many libraries create and maintain their own lists, too, so check out their sites. The Monroe County (IN) Library hosts a Children's Booklists on the Web page, where you can find a bunch of them in one place. Not all lists are created equal, and your librarian can point you toward some great ones or offer some "read alikes" that might work for the list you have. Now for the Million dollar question: Will my child will like the books on these lists? Odds are they won't like every book on any given list. They may not even like the first book from a list. Don't give up. If you get a couple pages in and the book isn't working, drop that one and find another one. If you've narrowed your options to things your child likes, it doesn't mean the entire list won't work, only that book. Just keep reading ... it's good exercise! Image credit: Toddler and infant reading - Beach Book Trip by Kristi on Flickr. Where to start? Let's say we're writing a recommended booklist for two year olds. The first thing to do is to think of all the books appropriate for two year olds. This involves reading the books that are brand new, browsing through the shelves, brainstorming with colleagues and remembering all of your personal favorites. Once that you've eliminated several titles, go through the library's catalog. Check every last book to make sure that the title, author, and call number appear on your list exactly the same way they do in the catalog. Then get someone (ideally someone who hasn't been involved in the project) to proofread everything for typos and mistakes you may have missed. You now have your beautiful and perfect list. But wait, aren't you forgetting something? You've got to print it. This involves designing it, laying it out on the computer, finding the cute pictures to go along with it, working with a printer, selecting paper size, type, color and quantity. Then you need to check the proofs from the printer and (assuming that you have the budget for it) get the lists actually printed. This is one of the hardest parts. Finally, after months of effort, you're holding the completed list in your hands. What to do now? Pass it out to every single person you can. Then, start the process from the beginning in a year or two. It's important to update them regularly in order to keep the lists relevant and current. Want to see the results? Click here and check out all of the Arlington Public Library lists for younger and older readers. For the younger folks, we've got Shower Your Baby With Books, Tales for Twos, 3, 4 Read Me More, and 5, 6, 7 Read it Again. For elementary school kids, take a look at our lists for kindergarten and first grade, second and third grade, fourth grade, and fifth and sixth grade. But wait, there's more! We also have a Historical Fiction list for first through sixth grade. Also, check out Terry's excellent post featuring suggestions of where to find many more terrific booklists for kids.